You can't have an October countdown without the seasonal pumpkin beers, and you can't have the seasonal pumpkin beers without the official Highbury Cemetery Drunken Jackos rating scale. A highly scientific review system that I put all season pumpkin beers through, presenting the rankings and results with the rest of the Halloween community. 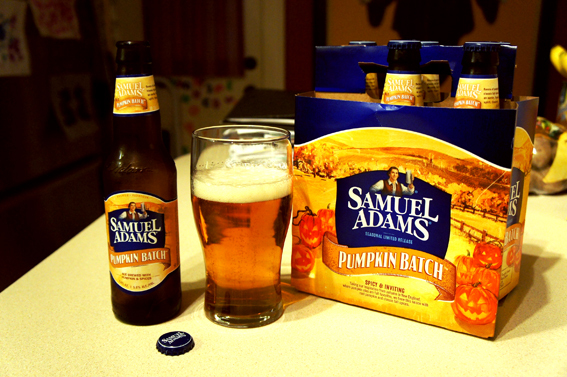 To start the season off, we have Sam Adams Pumpkin Batch. Upon opening this seasonal saison beer, I was hit with a pungent, earthy note. A strong initial scent versus any of the other pumpkin ales that I've tried this year. The beer itself pours a nice, light copper color and holds a creamy head. At first taste, this beer has a malty, dry, spicy flavor, but finishes with a secondary flavor that reminded me of hop (true to the saison style of brewing). Because of the saison-flavored uniqueness of this beer versus the standard selection of pumpkin ales you'll find in the stores, Sam Adams Pumpkin Batch gets 3 out of 5 Drunken Jackos. I highly recommend this beer as a change of pace from the rest of the pumpkin beer aisle. Not too heavy and a nice, spicy flavor. Definitely pick up a six if you come across it!